Luton boss Mick Harford has been pipped once more for the League One Manager of the Month award with Sunderland's Jack Ross receiving the honour. Despite taking 10 points from four games, Harford, who had also been nominated in January, saw Ross pick up the trophy for February, after going six matches unbeaten and taking 12 points in that time. George Burley, who chairs the Sky Bet Manager of the Month judging panel, said: "February was busier for Sunderland than most. 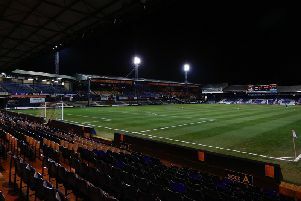 The nomination was Luton's fifth in row, with previous boss Nathan Jones in the running three times, winning the December award, which he picked up having already left to join Stoke City. On continually being recognised, Harford said: "It's down to the players, the players are the ones who go out there and perform. "We try and guide them, we try and help them in a way, but it’s support from everyone. "From the players, the staff, the board, and the fans who get behind the team and myself, so it’s a nice accolade."